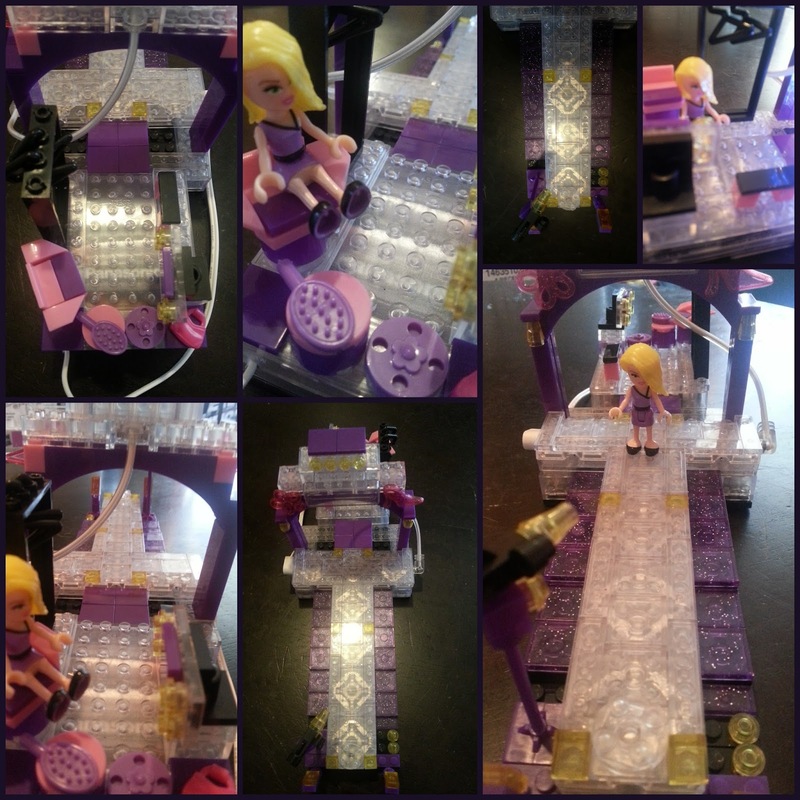 The Lite Brix Girls are a group of young, smart, and creative girls who are hoping to run the world someday soon. You can join them and create a fashion show of lights! Harper, the fashion stylist of the group always makes sure that her friends look their best. The girls are practicing backstage in the dressing room and preparing for their big moment in the spotlight! 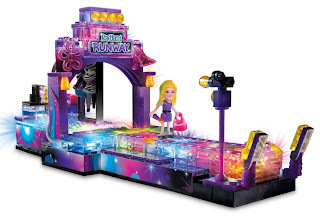 They can walk through the archway and LiteUp the radiant runway as they parade up and down in front of the cameras! 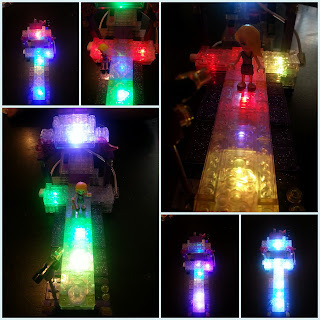 Lite Brix is the Super Building System where you can build light up environments and vehicles using Lite Brix, connectors, special shaped parts and brick blocks. Build a World of Light or add bricks from other building sets (sold separately), which attach to all Lite Brix. This set includes 1 Harper mini-doll figure, lots of accessories, a battery pack and a very well illustrated instruction manual. My 10 year old daughter and I sat down at the table armed with this pile of pieces and the instruction manual ready to take on the challenge. We followed the pictured instructions step by step only taking out the pieces as and when we needed them to insure we didn't lose any. Luckily the instruction manual was really easy to follow and we actually started to enjoy ourselves once we had relaxed a bit. Brick by brick, piece by piece, our runway was starting to take shape. We spend about 45 minutes creating our masterpiece as it was quite fiddly at times. I'm not sure if Chloe could have done it all by herself but I guess we had fun doing it together. It's aimed at children between 6 and 12, Chloe is 10 and found it quite difficult so parent help might be needed with this one. Once we had finished we were really pleased, we did it and it looked great. We were both very excited to swith on the lights, we couldn't wait too see it all light up. The lights are fabulous, they're bright and colourful and flash up in all different patterns. All that was needed was some music and some good old fashioned children's imagination and our fashion show was ready to begin. The Above is shows the runway with it's lights off. The Below picture shows the runway with it's lights on. 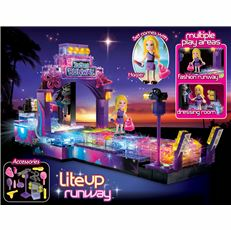 The Lite Brix Lite Up Runway costs around £29.99. It's a bit of a challenge to put together but so worth it when it's done. 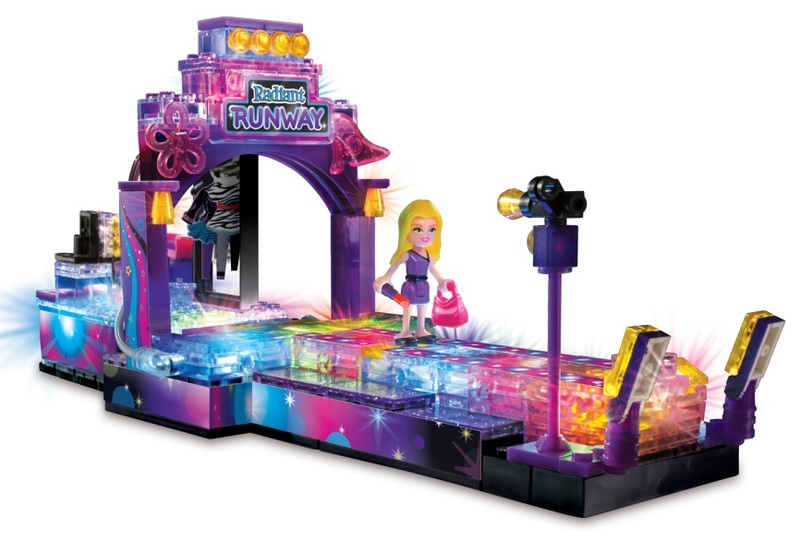 The lights are amazing and the cute runway is just lovely. Lite Brix are available in lots of different playsets for both Boys and Girls. 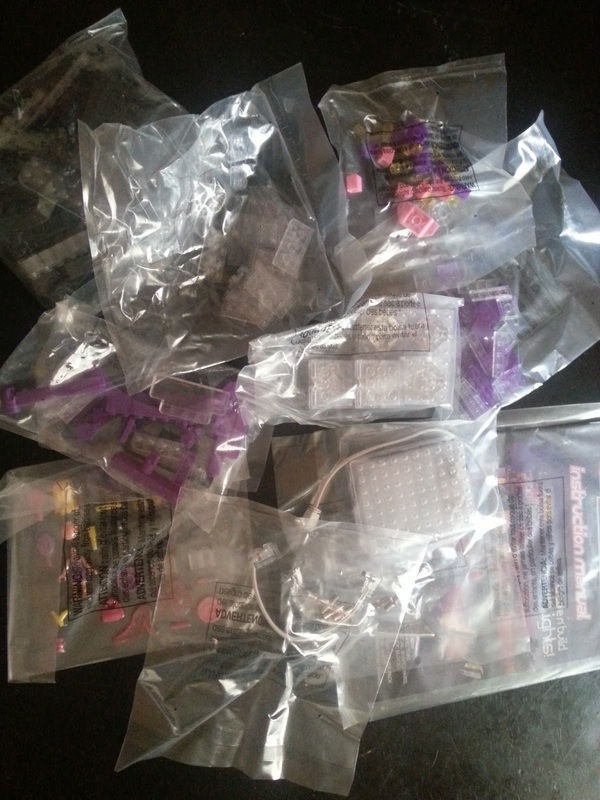 We've got the delicious looking Lite Brix Lite Up Candy Shop to get started on next. It's a slightly bigger playset which costs £39.99, we can't wait to get started on it. Mummy Of 3 Diaries received both of the Lite Brix playsets for the purpose of this review but our reviews are still 100% honest. All the opinions expressed are entirely my own.